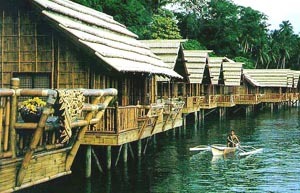 The Pearl Farm is located on Samal Island just a short boat ride from Davao City. The 11-hectare resort was once a real pearl farm that cultivated oysters imported from the Sulu Sea, and produces some of the best pearls in the country. Now the white sand beach resort is a top tourist attraction in Davao del Norte with cottages inspired by Isamal native design. 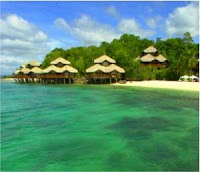 The Pearl Farm Beach Resort is situated on the isolated Samal Island, a 45 minute boat ride from Davao City. 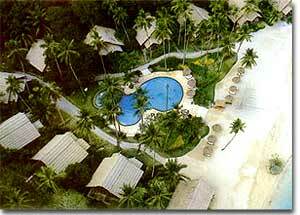 This private resort is surrounded by coconut palms and a white sandy beach. It offers quite and relaxation plus a choice of watersports for the more active. Rooms are in a traditional natural style blending in with the idyllic surroundings. Today, the resort has 73 fully air conditioned luxurious guestrooms, suites, cottages, and villas that sit around the contour of the island. Perched above the sea, the rooms and villas afford a breathtaking panoramic view of the deep blue waters of Davao Gulf. Each room is furnished with cable television, telephone, coffee/tea maker, mini bar, and room safe. The private toilet and bath are provided with hair-dryers.The villas were exquisitely designed from Maranao and Samal ethnic influences in both materials and forms. The facilities include outdoor swimming pools, tennis courts, badminton courts, basketball courts, souvenir gift shops, a luxurious health spa, a cocktail bar with the view of the sea and nearby islands, a restaurant that serves delicious Filipino and international cuisines of fresh seafood specialties, and fully equipped function rooms and boardrooms, and many others. Sports enthusiasts, and first-timers alike can enjoy the challenges of wind surfing, water polo, jet-skiing, water-skiing, banana boat rides, scuba diving, sea-kayaking, Hobie Cat surfing, and even underwater photography.